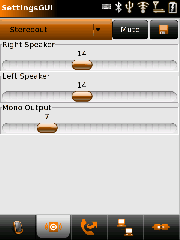 Until Openmoko releases an official GUI-Tool to change settings, SettingsGUI allows you to set various settings of the Openmoko smartphones. This program is written in Python using pygtk. It can be used only if those are present in your environment (see SettingsGUI#Environment). As there are no gsmd python bindings available at the time, SettingGUI uses python-subprocess and threads to communicate to the commandline of libgsmd-tool for the time being. To prevent interference with the GSM modem you have to expicitly power-up and register the modem by toggeling the "GSM State" checkboxes. NOTE: From Version 0.7 the atcmd mode of libgsmd-tool is used. To use it revision 2957 (2007-09-12) or later of gsmd is needed. If you have an older version of gsmd - or an older Openmoko image - use the upgrade function of ipkg, install a newer jffs2 image or use version 0.6 of SettingsGUI. Default configuration files are defined in GlobalConfiguration.py. The peer configuration, a connect- and disconnect chat script are written to /etc/ppp/peers/ on first startup if you don't already have a peer in /etc/ppp/peers/. When the connect button is pressed SettingsGUI will create latest_* files in /etc/ppp/peers/ and start the pppd with this latest_* peer. SettingsGUI also brings a default Nameserver in case you don't have a valid /etc/resolve.conf. The IP is from the OpenDNS Project and will only work if your GPRS provider allows DNS access to this server. If you have to change anything else than APN, user, password or dial in number for your provider please leave a note at the Discussion Page. 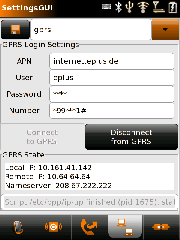 For details and background information on GPRS see Manually using GPRS. 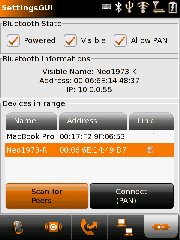 With SettingsGUI you can only connect using PAN. 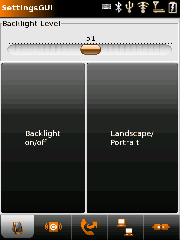 Due to display real estate problems Version 0.8 does not support HID pairing yet. The IP address for your PAN connection will be generated from a configurable mask (see GlobalConfiguration.py) and the last byte of the Bluetooth Address (think of MAC address). Default IP is 10.0.0.x. For details and background information on Bluetooth see Manually using Bluetooth. Thanks to Alessandro there still is the inofficial .ipk and a .bb file. Have a look at his user site. If you want to test this and do not have a build environment, you can 'ipkg install' the python components from the ScaredyCat Users Repositories. NOTE: These packages take up a considerable amout of space (about 10 MByte), make sure that you have enough free space or install the packages to the media card as explained in package management. Use the latest Version from SVN for now. You may not want to use those with FSO/ASU! - It WILL break the phone applications (no calls / sms)! 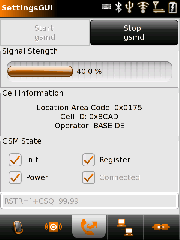 SettingsGUI is not yet supporting the new framework-stack, so you'll have to use gsmd for GSM/GPRS. Therefore you would have to install the packages and stop the gsmget daemon already running. Once you've installed gsmd it may start on every system boot, which may then prevent any other GSM daemon from starting. This may break your phone applications until you fix the problem again. This page was last modified on 1 December 2010, at 15:31.